April Poetry Book Madness! My kids loved participating in March Book Madness and have begged me to set up a poetry version for April. Please join to vote for your favorite children's poetry books. Introducing the Diverse Children's Book Linkup! There's still time to stop by and check out this brand-new book meme featuring books for children that showcase the diversity of our world. April: New Middle Grade Releases. A look at the month-ahead in new book releases, including the newest offering from Katie DiCamillo! Book Club: A Single Shard. This is a wonderful novel, set in ancient Korea, if you are looking to add more diverse offerings to your book club choices. Every year I have students that fall in love with this story! 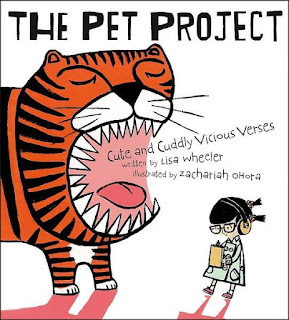 The Pet Project: cute and cuddly vicious verses (2013) by Lisa Wheeler and illustrated by Zachariah OHora. I read this one aloud to my students during library time, and they were delighted by the hilarious attempts of the narrator to poetically evaluate each animal's pet potential. The poems are quite fun when read aloud, but overall the book can get a bit lengthy, and my students were not particularly impressed by the "twist" ending. 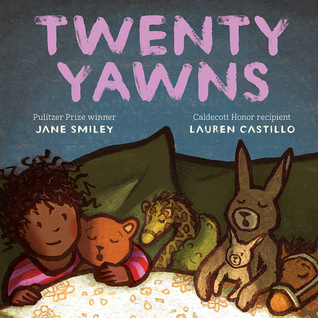 Twenty Yawns (2016) by Jane Smiley and illustrated by Lauren Castillo. This great, new bedtime story explores a full day as well as the mysteries of a quiet house when all the adults are asleep. I didn't have enough time to try and count up all twenty yawns within the story, but it's another feature certain to draw kids in. 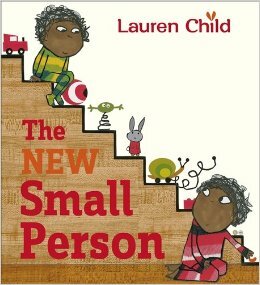 The New Small Person, written and illustrated by Lauren Child [a Zolotow Honor book]. Such a great new sibling book! I love how the narrator insists on referring to his new sibling as "the new small person" through the story. Of course there is a happy understanding reached at the end, but such a great journey to get there. Nice variety of books. I'll have to look at the ones by Lauren Child. Come see my week here. Happy reading! The Lauren Child book would be a good gift for a kid with a new sibling too! So funny, I did a post on the new April releases this past week, too! I adore Twenty Yawns. The page with the sunset, breathtaking! Agreed! I wonder what it is about the power of April book releases? Everyone is certainly making me want to read Twenty Yawns! I will get it for sure! Looking forward to your diverse children's book link-up, Katie. It will be a good thing! Thanks, Linda! I'm already getting new diverse rec'd and can't wait for more! This is the second post on Twenty Yawns. I did a double take at the authors name, since I associate Jane Smiley with adult books. I love The New Small Person, and The Pet Project looks like it will be lots of fun. Pet Project is quite humorous - but a bit tricky to read aloud! Twenty Yawns has been receiving a lot of buzz recently - I doubt if we have something as brand spanking new in our library, but will definitely check it out once it gets here. It is super cute - worth the wait. I love The New Small Person, I get a lot of requests for sibling books from parents, and I love that this one is sweet without being too sappy. Agreed! I also really love Little Miss, Big Sis, though it rates higher on the sap scale for sure. After reading Twenty Yawns about 300 times with my son (by his request), I assure you there are twenty. I have counted a few times. It is a great story, and I love it. I am glad you enjoyed it, too! Bwahaha! I'm sure you're not the only one! I LOVE the Pet Project! In fact, seeing it here reminds me to pull it out to use for some writing I want to do with my students! I must get a copy of Twenty Yawns! Perfect timing! Pet Project would be a fun one to discuss research too. Third time I've seen Twenty Yawns this week. I'll have to check it out!